My new store is open. I now sell prints on store envy. There are larger images of each print than the old store. I have around a dozen prints up now and will expand as demand requires. Please have a look and give me your thoughts. Tell me if everything is working. Did you find any errors, misspellings, that sort of thing. To show my appreciation there is a coupon code good till the first. Use the code “awesome” to get 20% off on all items. code expires August 1. Just got an update on Toys R Us May the fourth plans. There is a free Jek-14 build for children 5 and up. Plus a free Gauntlet with a LEGO purchase of $20 or more. Visit Toys R US for more information and some online games. *Offer available in-store only. Limit one per child. Quantities limited; no rain checks. 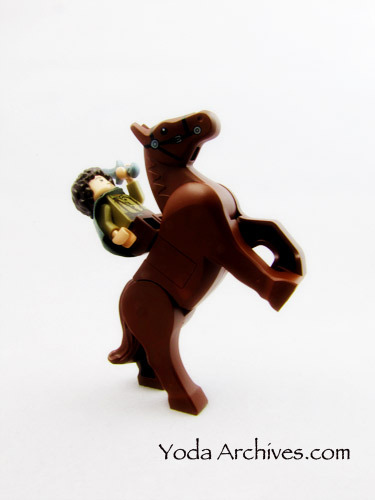 LEGO and the LEGO logo are trademarks of the LEGO Group ©2012 The LEGO Group. Event intended for children, ages 5-up. Parental supervision required at all times. All giveaways and event materials available while supplies last and distributed to participating children only. For my part in May the fourth celebrations I’ll be having an online print sale. 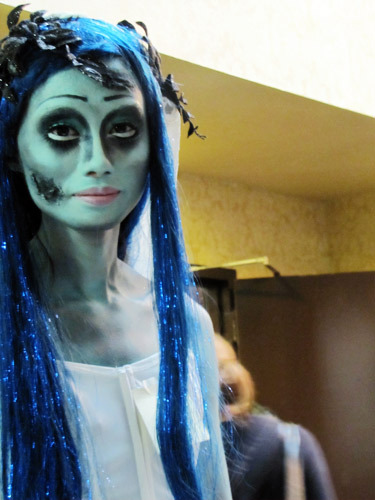 Details to be posted here on the blog tomorrow. UPDATE: My TRU is already handing out the Gauntlet polybag. They have signs in the LEGO Aisle about the promo offer. I saw a cashier get one from the service desk for customer that had a larger LEGO purchase. These mini legs are made for walking. 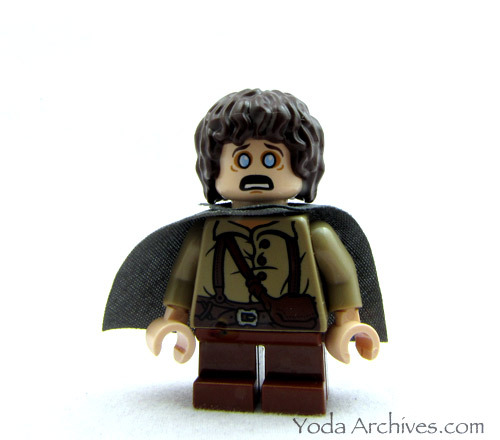 Hobbits can’t run, at least LEGO hobbits and other short character can’t run. Normal short LEGO legs are not moveable so the smaller characters cannot move, or sit. 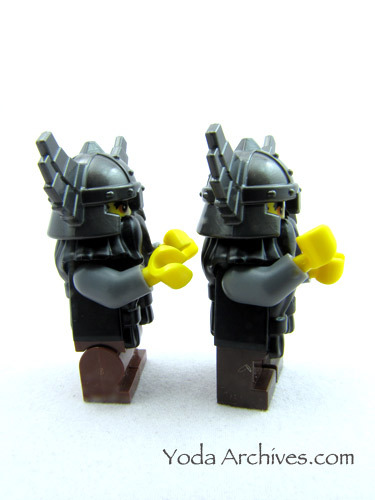 The mini-action legs offered by Brick Fortress allow poseability for the minis in either in your MOCs or stop motion films. I just bought a few of these and would like to share my thoughts on them. The legs are nicely made and feel similar to LEGO. They feel solid and move easily without fear of breaking like some knock off brick brands. The colors are near to LEGO colors. They are available in five colors now, others will be offered in the future, more on that later. Current color options are black, gray, dark blue, reddish-brown, and tan. Here we can see side by side comparison using the Evil Dwarf from series 5. 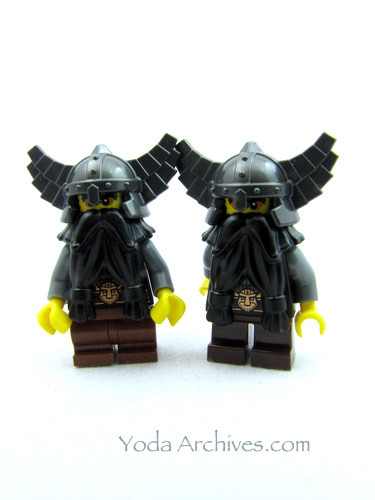 The dwarf on the Left has mini-action legs, the dwarf on the right has the standard legs.The legs have some curve to them rather than the straight look of LEGO legs. There is a center piece to the legs that allows the movement. And the legs are slightly taller due to the hips. 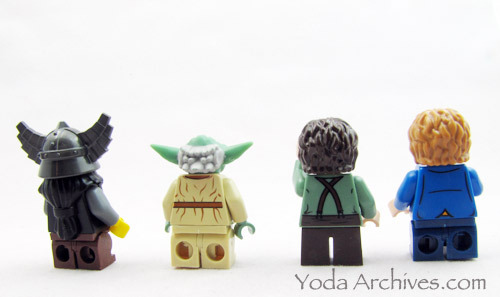 rear view: Dwarf w/ reddish brown, Yoda w/tan, Frodo in normal, and Bildo w/ dk blue. Price: The legs are listed for $1.25 each but currently sold for $1.15 each with price breaks at higher volumes order 20 or more and the price drops to $1.00 each and order 100 or more and they drop $0.95 each. Shipping is cheap. Plus They fill orders fast. I ordered on the 31st the legs were shipped on the 2nd and arrived the 4th. 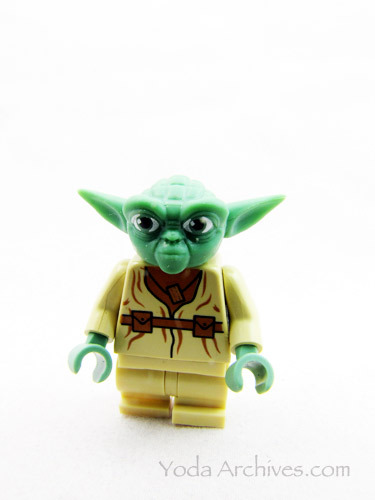 The tan legs match Yoda and allow the Jedi to Move. The next color will be.. up to you. Brick Fortress held a survey for most requested colors. The top four are now up for voting. The choices are: Dark Green, Green, Dark Tan and Dark Brown. 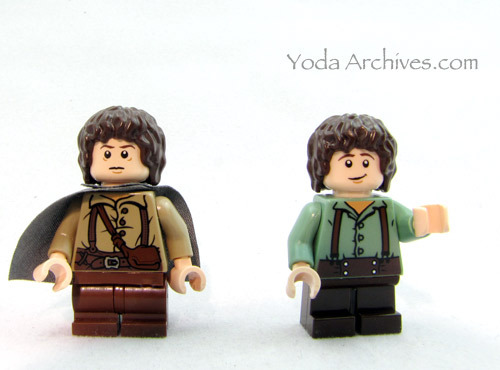 You’ll notice in the Frodo and Dwarf pics the color don’t match the original that because they figs were made with dark brown legs. Dark brown is not offered yet so I used the reddish-brown legs. I need my Hobbits to match. Frodo and Samwise can’t complete their mission if their outfits are not color coordinated. So vote dark brown Frodo needs action legs so he can simply walk into Mordor. Voting ends April 30th so be sure to get your votes in by then! Choose your color and vote! Frodo cannot walk he needs mini-action legs. Don’t let Sauron win vote dark brown legs! Summary:The legs are well made and look great. They function like the regular size LEGO legs. I can see these being used in stop motion films. You should try a few and give your figs added poseability. I have 100 Followers on here now thank you for following my work. Next weekend Murfreesboro Comic and Anime Kon. Lee Tockar(My Little Pony), Andy Price, Louise Dorsey, Alexandra Van Zeelandt, Jonhathan Glapton, Jacob Ropugemont, Raven Lee pin up model, Sam Flegal. Plus from The Walking Dead; Triston Johnson, Alex Wayne, Kevin Galbrieth, and Tony Gowell. We had a great time last year and are looking forward to MACK II. January 12, 2013 | Categories: Conventions, Photography | Tags: Aliens, comic books, comics, Conventions, LEGO, lego star wars, lord of the rings, Marvel, spread the word, The Doctor, videogames, vintage figures, walking dead | Comments Off on Next weekend Murfreesboro Comic and Anime Kon. Today’s Advent build is Darth Maul’s Sith Infiltrator. There’s online content as well this year. With each door has a code to enter on LEGO’s SW calendar page. There’s a small animation of the model. It’s like the item building scenes from the LEGO Star Wars Games. one a personal note my blog traffic has already passed last year December totals. and this month is now the second highest visited month in the history of the blog. Today’s Advent build is a Super Battle Droid. Today’s Advent build is another ship from The Trade Federation. Separatist Shuttle. Today’s Advent mini-fig is a Rebel solider. Really neat figure from Star Wars: A New Hope. He’s one of the first characters we see in the entire saga. He has a cool large hat which, like the rebel trooper in Hoth gear, has three visors. Actually, we have more Ninjago sets planned for next year and 2014! Stay tuned to our website, catalog, and club magazine for more information in the future! I heard that the Ninjago cartoon is ending and there won’t be any more episodes. Is that true? We have plans for Ninjago in 2013. We can’t tell you about them just yet. Even though we have new Chima sets coming next year, we also have new Ninjago sets too! Chima is a brand new theme, not a replacement for Ninjago. You’ll be able to get more information about Chima and Ninjago after the New Year!